iMacsoft DVD Ripper Suite for Mac is an all-in-one Mac DVD Ripper and Mac Video Converter suite for Mac OS X (including Mac OS X 10.10 Yosemite, Mac Intel and Mac PowerPC) users. It includes two powerful products: iMacsoft DVD Ripper for Mac and iMacsoft Video Converter for Mac. iMacsoft DVD Ripper Suite for Mac can rip DVD and convert various video formats to video and audio formats for iPod, iPod touch, iPod touch 4, iPad, iPad 2 the new iPad, iPad mini, iPad 4, iPhone 3, iPhone 4, iPhone 5, iPhone 5S/5C, iPhone 6/6 Plus, Apple TV, Xbox 360, Zune, PSP, Pocket PC, Creative Zen, and Archos and so on. iMacsoft DVD Ripper for Mac can perfectly rip DVD movies with no loss of image and sound quality. iMacsoft DVD Ripper for Mac supports almost all popular portable devices such as iPod, iPod touch, iPod touch 4, Zune, iPhone 3, iPhone 4, iPhone 5, iPhone 5S/5C, iPhone 6/6 Plus, iPad, iPad 2, the new iPad, iPad mini, iPad 4, Apple TV, PSP, Xbox 360, PS3, MP4 and MP3 players, Pocket PC, PDA, Mobile Phone, Archos, Archos AV500, Archos AV700, Archos GMini402, iRiver PMP-100, Creative Zen Vision, etc. iMacsoft Video Converter for Mac can easily convert videos to the target video and audio formats. It supports so all-around video formats, such as WMV, AVI, DivX, MPEG, MP4, H.264/MPEG-4 AVC, RM, RMVB, MKV, MOV, XviD, FLV, SWF, 3GP, VOB, DAT, and so on. Moreover, It can also extract audio from video file and convert them to M4A, MP2, MP3, AC3, AAC, WMA, WAV, OGG, AU, RA as you want. Free get iMacsoft DVD Ripper Suite for Mac now and be your DVD and video master! iMacsoft DVD Ripper for Mac can perfectly rip DVD movies with no loss of image and sound quality. iMacsoft DVD Ripper for Mac supports almost all popular portable devices such as iPod, Zune, iPhone, Apple TV, PSP, Xbox 360, PS3, MP4/MP3 Player, Smart Phone, Pocket PC, PDA, Mobile Phone, Archos, Archos AV500, Archos AV700, Archos GMini402, iRiver PMP-100, Creative Zen Vision, etc. 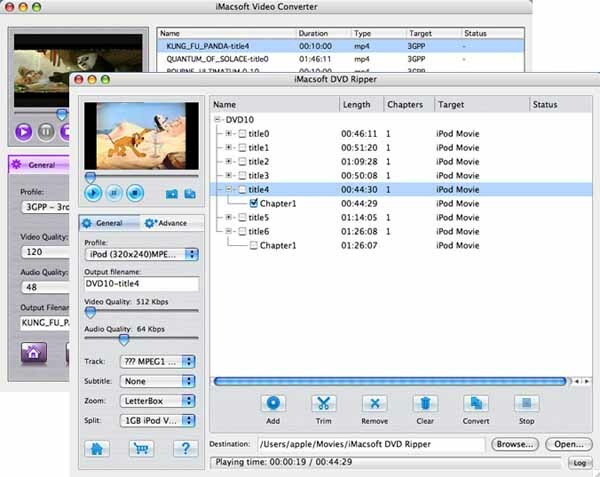 iMacsoft Video Converter for Mac supports so all-around video formats such as WMV, AVI, DivX, MPEG, MP4, H.264/MPEG-4 AVC, RM, MOV, XviD, FLV, 3GP, VOB, DAT, and so on. It can also extract audio from video file and convert them to M4A, MP3, AC3, AAC, WMA, WAV, OGG as you want.